The American Animal Hospital Association and the American Veterinary Medical Association have paired up to develop preventive feline healthcare guidelines to help veterinarians and cat owners keep cats healthy and happy. All medical professionals are increasing their reliance on scientifically grounded clinical guidelines such as these to improve patient health, quality of care, and quality of life. Veterinarians recognize the usefulness of these guidelines in elevating the standard of care they can provide to their feline patients. The guidelines can ultimately help cats live longer and healthier lives. We know that most cats do not receive the level of veterinary care that they need and deserve, mostly because they don’t visit their veterinarian frequently enough. These cats are missing out on regular wellness care, and their owners aren’t taking advantage of professional health guidance from their veterinarians, both of which can help extend cats’ lives. What benefits will my cat and I gain from these guidelines? The guidelines empower veterinary healthcare teams and cat owners to work together on behalf of a cat’s best interest. Preventive care and early intervention in diseases provide well-established and well-accepted benefits in human medicine and human dentistry. Now that cats are living longer, they too are developing age-related illnesses and issues, such as osteoarthritis, hyperthyroidism, and cancer. 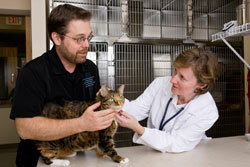 Your veterinarian plays an essential role in maintaining your cat’s health and wellness. Part of his or her goal is to help cat owners understand the importance of preventing diseases or at least catching them early, when they are more manageable. The guidelines provide a coherent and straightforward plan that promotes prevention and early intervention and can ultimately help cats live longer and healthier lives. How does the information in these guidelines differ from what I can find on the Internet? The Feline Preventive Healthcare Guidelines reflect the best available scientific and clinical information for enhancing your cat’s health and quality of life at various life stages. This is information that is often challenging for pet owners to find on their own. In addition, the guidelines translate evidence-based medicine into everyday actionable best practices, empowering veterinary healthcare teams and cat owners to work together on behalf of a cat’s best interest. What are the details of the preventive healthcare guidelines that apply to my cat? The guidelines recommend that all cats receive a complete veterinary examination at least once a year, although many cats should be seen more frequently, depending on their individual needs and health concerns. The visit should include a review of the cat’s recent history, lifestyle, life stage, activities of daily living, general behavior, and diet. The physical examination itself should include a dental assessment, pain assessment, and body condition scoring. 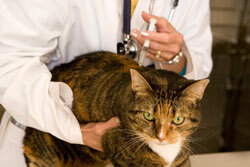 All cats should receive a complete veterinary examination at least once a year. The next step will be for your veterinarian to make a specific and detailed preventive healthcare plan for your cat. Such a plan will set expectations for necessary follow-up, including the timing of upcoming appointments and the expected focus of those visits. Your veterinarian can provide you with a written summary of the plan for your cat’s record at home. Indoor-only cats can acquire infectious disease. They need to be protected through appropriate vaccinations, too! Appropriate vaccination to prevent infectious disease is a key component of preventive healthcare for cats. Your veterinarian will determine both the core and non-core vaccines that are most appropriate for your particular geographic area based on the most up-to-date vaccination guidelines. It is completely untrue that cats that live exclusively indoors cannot acquire infectious diseases. These cats need to be protected, too! Can I expect that every visit my cat has with my veterinarian will be the same? Medical knowledge and understanding of disease prevalence and processes are constantly expanding. The Feline Preventive Healthcare Guidelines are designed to be modified and updated as newer information about keeping cats healthy becomes available. In addition, veterinarians already understand that as cats age, their needs change and their risk for various diseases increases. Kittens have different preventive healthcare needs than young adults, and senior cats have their own unique needs. Year to year, the details of a cat’s veterinary visits will change, but the underlying emphasis will remain the same—a focus on maximizing our feline companions’ health, wellness, and quality of life!